AO Interviews with curators Meg O’Rourke, Caris Reid and artists Tony Oursler and Rachel Garrard. 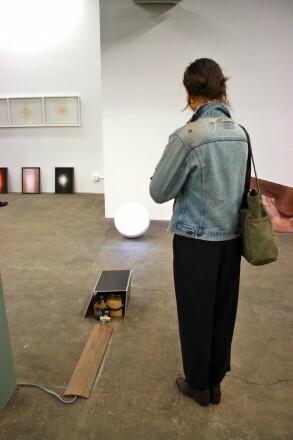 A large-scale group show opened last Friday night in Greenpoint at Allan Nederpelt, showcasing 17 new artists such as Tony Oursler, N. Dash, Rachel Garrard, and Matthew Stone in the colossal space on Freeman Street on the very north-east tip of Greenpoint. 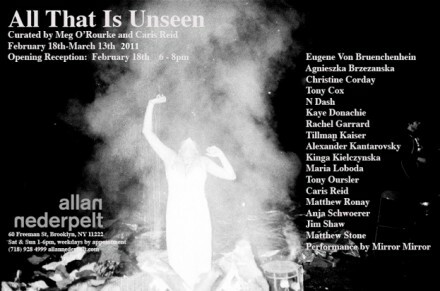 The recently opened Allan Nederpelt exhibition space housed a large number of works all concerned with the idea of “Art addressing Metaphysics” and the artist’s relationship to the external world, the exhibit titled “All That is Unseen.” Curators Meg O’Rourke and Caris Reid believe that this interest in the ethereal and otherworldly is partly a reaction to the mounting scientific complexity of our time, and marks the beginning of a transition in creative attitude. O’Rourke states in the press release, “Just as delving into spiritualism (along with shifts in science and technology) led to the birth of abstract art at the beginning of the last century, we feel we are currently at the edge of a collective shift.” Works ranged in a variety of mediums, from wooden sculpture to new media to electrical design. Tony Oursler, Occult (untitled) for Cage (2011). Photo by Daniel Terna, Art Observed. View of All That is Unseen exhibition, photo by L. Streeter, Art Observed. 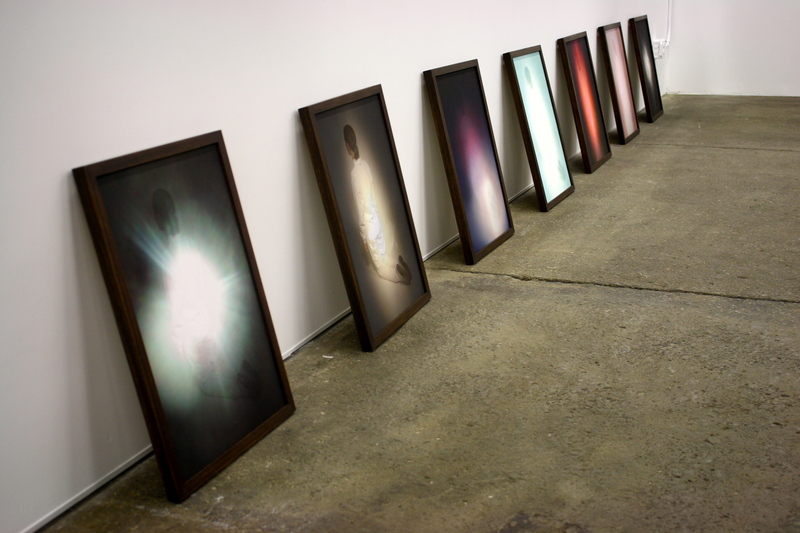 Rachel Garrard, The Clear Light of Death, (2006). Photo by D. Terna, Art Observed. The installation featured a wide range of artists, from established creatives such as Tony Oursler and N. Dash, to American outside artists who remained virtually unknown until after death. One such outsider, Eugene von Bruenchenhein depicted his visions of an alternate world in bright pigments applied to the canvas with brushes made of his wife’s hair. The wide arrange of artists and minimalistic use of space lead to a very balanced yet vibrant surrounding, with onlookers fluidly moving from piece to piece. Many of the pieces seemed to exhibit similar references to classical themes which offered a greater unity to the exhibition. Rachel Garrard’s laser-etched form studies call to mind the mathematic forms of Da Vinci’s “Vitruvian Man”. Simultaneously, Matthew Stone‘s wooden photographic prints make use of the human form as a focus point depicted much in the style of Boticelli or Titian. AO: Can you talk a little bit about the process behind these? R: These are laser-etched prints, so it’s like laser-cutting but it burns the paper. If you look up closely, the line’s kind of burnt. They’re taken from a larger body of work I’ve been doing called “The Seven Transmutations” that started off as a series of seven pencil hand-drawn integrated drawings that are based on what I’m calling “Perennial Symbols”, symbols that pervade cultures throughout history. 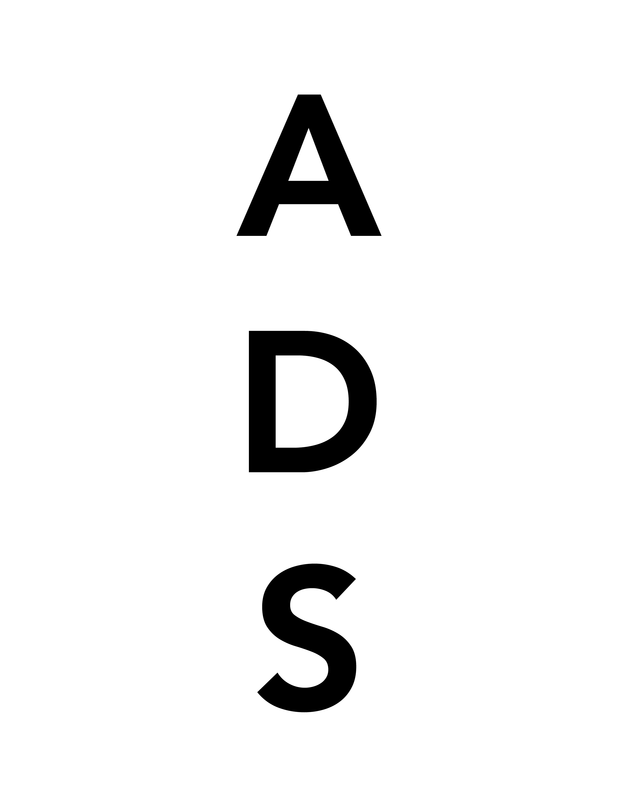 These are compiled in a way that they correlate to the human body’s geometry. The piece itself I made into a 3D animation, and I’ve shown a couple of times, most recently this weekend at Kinetica Art Fair. It’s a 3-dimensional holographic projection, in which I’m performing inside the hologram. It’s kind of a spherical drawing, building up over time. These are taken from the animation, at different stages in the process of it building up. AO: How do you think of your work in terms of the entire show? R: I think it fits quite well; the show’s all about artists dealing with metaphysical subject matters, and some of the artist’s work I really admire. The performance itself shows the human body and the ethereal energy layers outside the body, so I think it’s a nice fit of artists. AO: Bravo, show looks really good. Maybe you could give us a little background on yourselves and how you started working together? M: I think my original inspiration was seeing a Walter D. Maria piece at Gagosian… I can’t remember the exact title but it was basically about a computer could solve the world’s problems; it was a sequence of numbers. It just spoke to me so much about this idea of trying to establish a relationship between form and symbols and the cosmos. There was something really beautiful and harmonious, and combined with that I felt like i was beginning to pick up on this zeitgeist, which was people searching just for things that were mysterious, that we couldn’t see or were mystical and I just started to pick up on that vibe and the more I focused on it, the more I saw it. I started to see shows more recently being done about alchemy and that type of thing. A friend of mine is doing a show on secret societies and the occult and the more I thought about it I just felt like this was infiltrating the culture and I’d never seen that before the New York art world for 20 years, working as a critic, working as a curator. I’d never seen this material before. 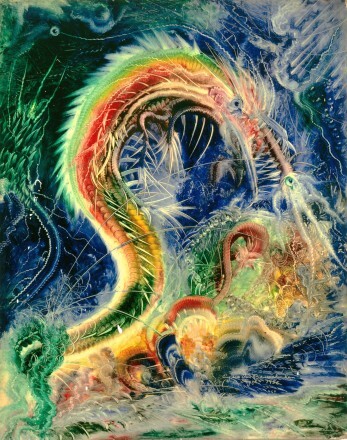 I was also aware of this show called “the spiritual in abstract art” which was an L.A. County museum show done 1989 curated by Maurice Tuchman. It was all about artists delving into spiritualism, a lot of theosophy for example Kandinsky, Mondrian, Malevich and how that gave birth to abstract art. I was thinking about these ideas and then Caris and I, sort of very mysteriously but in an orchestrated way came into each other’s lives. Caris had been thinking about these ideas, exploring them in her work and exploring them just as an idea about art, and then we were put in each other’s paths. C: It’s something I’m very interested in and I deal with a lot in my work. The sort-of pinnacle moment was in Berlin, while I was doing a residency and I wrote an article on synchronicity and about one of the artists in the show, actually Kinga, who was in a cult at the time called “Modern Life of the Soul”. Meg read it and it reminded her of her idea, and then it was just this sort-of beautiful moment where it all came together and we decided that we should do the show together and that we really wanted to make a show where all these topics that have been so taboo for so long were very much out in the open. I think there’s a really sincere energy in the show and I think all the artists in the show are sort of tapping into that realm in a variety of ways. 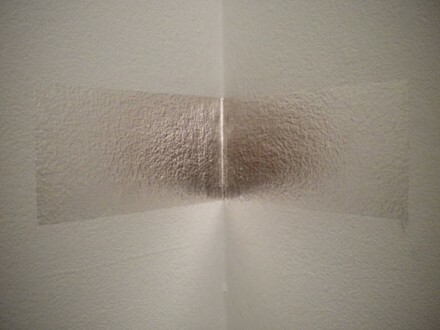 Kinga Kielczynska, Digital Enlightenments. 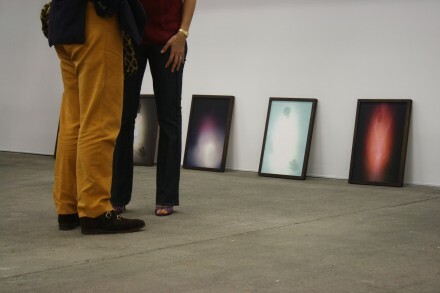 Photo by L. Streeter, Art Observed. AO: You’ve got a really diverse range of artists in show, from outsider artists to established names…How did you go about choosing the specific artists to show? C: I think it came about really organically; there were a lot of beautiful ways in which I would see something and then Meg would see it; we’d compare notes and would have been thinking about the same artist. M: I would meet someone for five minutes at an opening, and would think about her and would research the work. Suddenly, Caris would be having dinner with her two nights later. I mean a certain energy just came around, and artists would even say “have you thought about this person?” There was just a kind of organic flow that shaped the whole thing. I think any kind of creative project, once you put the energy out there it has a life of its own. AO: Was most of the work shown before, or was there any work specifically created for the show? M: Some of the work was made for the show, the Tony Oursler piece for example was created for the show. The Matthew Stone pieces against the wall (points). C: There was a lot of work created for the show. The Tony Oursler piece was really special; we knew he wanted one of his eyes, and we were really surprised when he made one of his eyes specifically for us… The title is “Occult (untitled) for Cage” and if you look at the piece it’s beautiful. You see the eye, and then the iris of the eye has this smoke streaming through, and cuts of a depiction of priest inbetween. M: Tony Oursler has amassed master collection of occult photography over the years. These photographs were used to stage spector for the believing and the unbelieving and so we’re looking at this eye that’s looking at these images of photographs that are looking at these other ghosts and so its just one spector after another. The whole question of reality is problematized. I know he’s had conversations with John Cage about metaphysics, and I’m trying to get more from him tonight on that. I feel like John Cage was such an influence on Richter, on so many artists which shouldn’t be underestimated. AO: One of the great things about the show is seeing all the work in one place, and seeing how they really seem to vibe off of one another. Rachel Garrard’s pieces work so well with the classical feeling of Matthew Stone’s 3-dimensional wood prints. How did your ideas change as the show progressed? M: I think that its important to note that first of all, when we were initially dealing with the subject matter, we were very nervous. When we first started talking about it, people, I think their minds went to “oh my god, chakra paintings in a yoga studio.” So you’ve got to hit it from a sophisticated angle and I think it’s important when you’re curating a show to get artists who are approaching the subject matter in a variety of ways. The way that they’re approaching the material creates the shape of the show just as much as the theme does. AO: Were there any core artists you built the show around? C: I wouldn’t say that there is any artist we built the show around, per se. I would say that in my mind, Kinga was the starting point, she was the one I wrote the article about. She was an integral person in terms of putting the body of work together. I really feel like everyone who was in the show was really meant to be in the show, and I really couldn’t imagine the show with anyone removed from it. Everyone ties into each other so beautifully. AO: There are a lot of diverse mediums in this show, ranging from sculpture to media work. You’re describing this collective shift… How do you think our ways of seeing have changed? Do you think this show illustrates a shift in the way artists are perceiving the world? C: Yeah, definitely. I think there’s a collective shift going on with everybody, and I think artists have always been good at showing what’s coming next. They’re tapped into this energy, like mediums showing what’s coming next. You can always tell what will be hitting the rest of the populace, like a Kandinsky-esque triangle of energy flowing down. M: I don’t know what it’s giving birth to, I mean clearly, in the in the turn of the 20th century the birth of abstraction was like a watershed in the history of art. I don’t know what’s coming, I just know that there’s a search taking place. I feel that it’s much needed, and there’s a lot of noise and unrest and we’ve seen art become this culture of spectacles, always driven for the bigger and better. It’s very exciting, and yet I think to look for something that’s soulful and beautiful is more satisfying. AO: The work does have this sense of physicality to it. Especially as art goes towards new media, what do you think the importance is in physical material and the physical body? C: There are artists like Marina Abramovic who don’t believe in any sort of materialization whatsoever, and I actually generally like this idea of moving away from materialization into a de-materialized state. We do live in our physical bodies, and there are so many physical objects around us that are not beautiful and not harmonious that in my mind the more beautiful objects maintain a sense of harmony that we sponge off of. M: You can worship off relics. Speaking as an ex-catholic, I believe Catholics can worship with their eyes. AO: Do you feel like this zeitgeist, or collective shift embodies a new way of seeing? How is sight being changed? M: Originally we talked about what’s happened in the last ten years, which has been radical. I hate even the sound of the word technology, it makes me feel like, you know, my brain is being fried. But there’s something about the way that we communicate without words so frequently. As Caris put it in one of our proposals “The computer breaks the body from the self”. So there is this way in which things are shifting around in a way where you’re not using your eyes as much. C: We live in a world now where we communicate with people, we see their physical presence hovering in our living room when they’re not actually there and I think that sort of experience opens people up conceptually to the idea of understanding things that may not physically be there can harness a presence or a sort of power. There’s a similarity now going on with technology and the way people are opening up to spiritually (ugh, I hate that word), things that are a little bit more ephemeral, mystical and unseen that really parallels to the time when new technology was being created in the 19th century. The telephone and the telegraph came out, and people began seeing that as a metaphor for conjuring the dead and talking to spirits because in a way when you get a phone call or a telegram, there’s something very phantasmagorical about that. I think there’s a similar thing happening now. M: Yeah, and I think its about hope. Matthew Stone is someone whose optimism is cultural rebellion and he’s gotten a lot of attention in London for staging these openings. We can talk about relics, and seeing and theories, the fact is, we want to commune. We want to commune with our fellows, and we want to commune with something larger than ourselves and I’m seeing it bubbling up through art in a way that I’ve never have before, at least in the past 20 years. AO: How do you think the show deals with the issue of space and physicality? C: I think there are artists use whose the space very much conceptually. N. Dash’s work, for example, really is just a little silver sliver on the corner of the wall at her eye height that extends to her wingspan. She’s assuming this space around that piece of silver but in a way it’s imagined. It only exists if you acknowledge those parameters she is designating. M: That’s nothing new. I think art is a concept, coming out of decades past, but I don’t really know how this going to alter the form. AO: N. Dash is more established artist. Are there any new or emerging artists you’re representing in this show? C: Eugene von Bruenchenhein was a baker, and his work wasn’t discovered until after he died. His house was discovered full of all these photographs and paintings he created obsessively. He photographed his wife for 30 years and did these really intimate scenes with her where she would wear these costumes and he’d make crowns for her. It was almost as if they were creating their own universe, to help them transcend their mundane existence. He would paint with fingers, with sticks. He believed these spirits would sit on his shoulder and talk to him, channel some kind of energy as he painted. AO: What kind of impact are you hoping the show will have on the viewer? C: More than anything, I think its about an expansiveness and openess. I don’t think we’re necessarily trying to make a statement, it’s more that we’re just trying to be one more dot in something that’s already forming. Curator Caris Reid and friends. Photo by D. Terna, Art Observed. 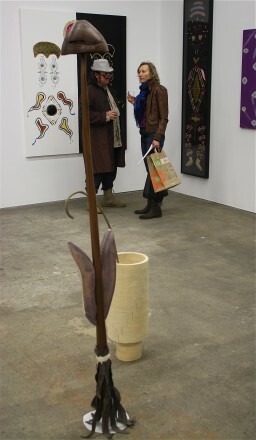 After the initial opening, the equally-spacious back room opened up as gallery-goers filtered in for the “after-party”. Complete with food and drinks and a live performance by indie band “Mirror Mirror” the party continued on for another hour or so. Mirror Mirror is a Brooklyn – based group who specializes in experimental visuals as a part of their performance. They additionally played a show at PS.1 the following day on Saturday afternoon. Mirror Mirror Live Performance (2011). Photo by Daniel Terna, Art Observed. The gallery also hosted a salon-style event the next day in the afternoon, where guests were invited to discuss the relationship between art and metaphysics in a session called “Interconnected Echoes”, lead by artist Matthew Stone. 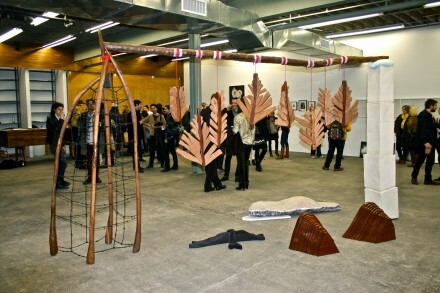 This entry was posted on Monday, March 7th, 2011 at 2:24 pm	and is filed under Art News. You can follow any responses to this entry through the RSS 2.0 feed. You can leave a response, or trackback from your own site.